What would you like to remember from 2014? Here’s our list of most significant events, of course stadium-wise. 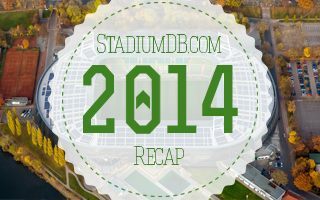 Having listed ten negative or controversial issues of 2014, here’s what we enjoyed in the passing year, even if it didn’t always make headlines at StadiumDB or anywhere else. Your thoughts? Share on facebook and twitter! We were among critics of this stadiums, when it was approved without an actual business plan and no key tenant. And yet in 2014 it proved us and many more sceptics wrong. Poland’s national stadium became the home of national team and Polish Cup final games. Football aside, it held more diverse events than any venue ever on a weekly basis. One week the volleyball World Championship opening, athletic event the other. Windsurfing championships and then desert racing event. And now, when most stadiums stand empty, it’s the most occupied leisure destination in Warsaw with indoor ice rinks and other attractions. On the downside Narodowy did prove far from perfect for large concerts. But it still manages to march towards earning money for the taxpayer, a thing many wouldn’t have believed a few years ago. We’ve seen more than a few impressive training academies over the years, but Eastlands take the cake being just meters away from Etihad Stadium and comprising pretty much everything one could imagine. And while we haven’t surveyed local residents, the club did take some effort to make the academy and improvement for the entire community. In 2014 we’ve uploaded more renderings than in any previous year and it wasn’t easy to select the most appealing design. But while Qatar’s visions are more spectacular and Sydney’s ANZ Stadium wins in terms of advanced technologies, we take Budapest national stadium as the best. It’s respectful for the historical context and doesn’t neglect other sports disciplines despite being football-specific. Training running track overlooking the pitch and city skyline is really imaginative, too! And though it seems to be oversized (matching Hungarian football legend instead of actual demand), it also comprises enough infrastructure to make it sustainable. It’s not the first country that comes to mind when you think “football-mad”. Well, it deserves to. This passing year Icelandic football clubs and the national team made some waves in European football. And 2014 is also the year we’ve seen the new national stadium renderings and the immensely impressive Hafnarfjarðar training complex. Who would have thought not being aggressive towards people doesn’t make them react with aggression too?! Well, the experiment of North Rhine-Westphalia went extremely well and sets an example that matchday policing goes better when confrontation is avoided. It’s actually both safer and cheaper. OK, so some supporters call it Arroganz Arena (rightly) and TSV1860 fans would rather watch their team nearly anywhere else, but it was the year Allianz Arena stood out again. The stadium is having several upgrades (standing sections, illumination, capacity increase), sells out every Bayern game well in advance and got on the list of Euro 2020 hosts. Not only that, Bayern paid it off completely in 2014, well ahead of schedule. As usual it’s a pandemic hysteria across the media before the tournament and nothing serious happens. Obviously Brazil has some serious thinking about spending or working conditions at their stadiums, but facts are they also held a fantastic World Cup and deserve highest praise as a nation. Let’s only hope they manage to make the best of its legacy. Yes, the headline was meant to sound wrong. But while we’re not discussing controversial politics of the Central-European country, Hungary sets a model with their national stadium improvement program. In 2014 two impressive stadiums were opened, first elements of the scheme to deliver over 20 (!) venues across the country. And so far we know that Hungarian projects are very fast, very cheap and despite that manage to present high quality and future potential. With several concepts up for groundbreaking in 2015, there’s a lot to look forward to! Why damage eyesight when you can use the solar energy to power stadiums? 2014 saw a great increase in powering stadia with renewable energy. Whether it’s Brazil, Netherlands, Japan, Taiwan or Germany, solar panels are spreading across vast roofs, providing power for the venues and the grid. We’re still nowhere near powering stadiums with only renewable sources, but it’s a major step forward and one to embrace!